I am writing this blog to describe how to develop SAPUI5 and Flask app on Cloud Foundry. If you want to know more about logging from python on Cloud Foundry, see another article “Output logs from Python Flask application deployed on Cloud Foundry”. Open SAPUI5 app with chrome extension “Allow-Control-Allow-Origin”. 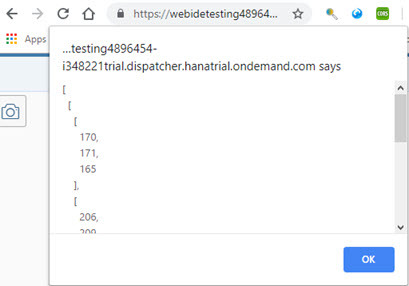 I somehow open “extended_runnable_file.html” from Web IDE test and get error. When opened url path is “extended_runnable_file.html”, then change it to “index.html”. 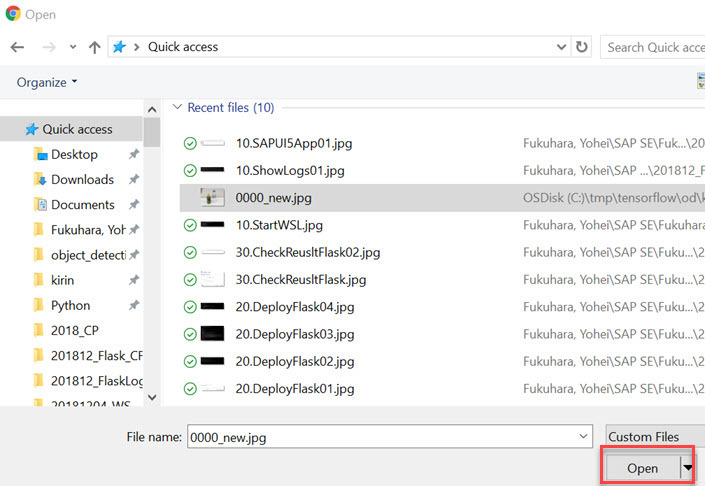 Select an image file to pass to Flask application. Returned result is displayed as an alert screen. Application is on my GitHub Repository “cloudfoundry-python-flask-image”. I used pillow library for image processing. Received image data via POST method is resized using “thumnail” function. And I change data format using numpy library. The program is on my GitHub repository “YoheiFukuhara/post-image-from-sapui5-to-flask”. Here FileUploader’s attribute is “https://<url>”, so it fails with CORS basically. It is very easy to avoid CORS by configuring Destination. Why I don’t use “Destination”is just I want to make the app simpler. I avoid CORS error by using chrome extension “Allow-Control-Allow-Origin”. An attribute “name” is so important, since the name “sampleImage” is used in Flask. <unified:FileUploader name="sampleImage" uploadUrl="https://flask-image-patient-lynx.cfapps.eu10.hana.ondemand.com/" buttonOnly="true" icon="sap-icon://camera" iconOnly="true"
Function is called when POST request is completed. This is very common way to process image. I hope it makes your development easier.